Yes, that's right! This comes straight from Condi's reluctant neighbor! Peafowl found their way to the San Gabriel Valley when Arcadia’s founder Elias J. "Lucky" Baldwin imported the birds to Arcadia from India in the early 20th century. Like Adam and Eve, they've apparently populated the earth with their incestuous offspring. Peafowl continue to thrive in the area today, especially at the Los Angeles Arboretum. Unfortunately for me, they get around in more ways than one. I live NOWHERE near there, and yet you've seen the photos. Native to India, Burma, Java, Ceylon, Malaya and Congo, peafowl are relatives of pheasants. The difference is in the plumage. The term "peafowl" refers to the species. The males are called peacocks. 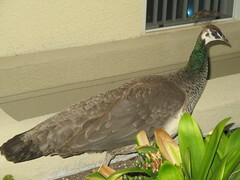 The females are called peahens. Offspring under the age of one year are called peachicks. Peafowl are very hardy birds and live long lives. Peafowl can grow to a maximum of 10 pounds and can live up to 15 years in captivity; however, the life expectancy in the wild is difficult to determine. I hope that my apartment complex in Pasadena is considered less hospitable than "captivity." The India Blue peafowl is the most common in this area and the one with which people are most familiar. They are omnivorous, which I find unsettling. Could Condi the Peahen decide to eat her human neighbors one day? I hear that they eat snakes in India. That's what all the tapestries my peeps made in the old country suggest. Hearts for Giggles. You love, no? I love smart friends and can bust out with information like this! Giggles is way cute! I love that she had a full explanation for where the hell a bird like that came from and that she shared. Awesome. Cute. I gave her 5 stars! She has to cohabitate with a bird unwillingly?!?! Oh, hells no! I love it! I guess it's not so random!